Once a year in Jindo in Jeollanam-do province, the seas mysteriously part just like Moses’ miracle and visitors can walk through the sea from the mainland to a nearby island. This phenomenon is caused due to the difference in high tides and low tides, which creates a 2.8-kilometer-long road measuring 40 to 60 meters in width. 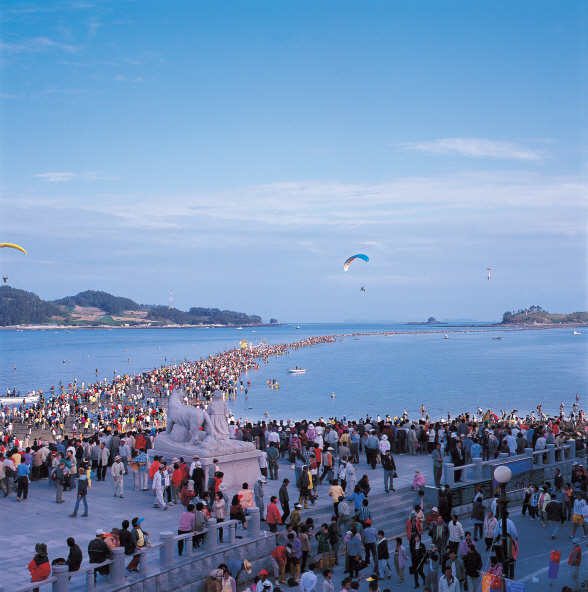 The Jindo Sea-parting Festival takes place at the same time as this phenomenon. Visitors can enjoy walking along the sea road, gathering abalone and various other fun activities that make up the festival program. The spectacular sight of the waves parting is widely known and many people travel to Korea from all over the world, especially to witness it. From Seoul’s Central City Terminal, take an express bus headed towards Jindo (4 buses daily at 7:35am, 9:00am, 3:30pm, 4:35pm / est. travel time of 5hrs 20min) and get off at the Jindo Bus Terminal. From the terminal, take a city bus (towards Hoedong-ri in Gogun-myeon) or a taxi (est. travel time of 30~40 minutes) to the festival location. If you have any questions or help, please just call me or email to me.